First off, this gorgeous icy lemonade bracelet. So bright and fun!! Don't you think this would look stunning with that little black dress or shirt, or that flirty white summer dress? This would add the perfect dose of brightness and will definitely make you smile whenever you glance at your adorned wrist! I also really like this twisted garden path choker. Although it's hard to tell from the picture, this choker is made up of hundreds of pastel coloured gemstone chips and leaves, all twisted together to made a gorgeous rope that is perfect for spring. Finished off with a fancy clasp, this necklace is stunning! In fact, I don't think your Easter outfit would be complete without it... or without this matching cottage garden bracelet. Ok, so technically they don't "match" but the garden theme, pastel colours and profusion of pretty beads ties them together for me. And either way, they are both show stopping pieces. 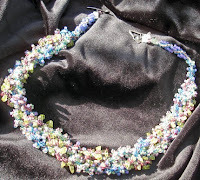 Really, this bracelet is perfect - lovely pastels, flower and leaf beads and a purple button clasp. You can't go wrong!! 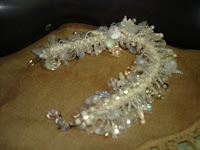 Finally, this ice maiden bracelet caught my attention. Another striking piece that is sure to complement most items in your wardrobe. Although perfectly wintery, this bracelet will also help you cool down in those hot summer months that seem so far away still, but are sure to be here before you know it! Well, those are the items from cigarboxbeads that caught my eye, but don't let that stop you from browsing through her store - there are plenty more amazing pieces waiting for you to discover! And if that weren't enough, Marilyn runs another shop, suchandsort - which is having a leap year sale right now! Go check it out, and then stop by her blog and leave a little love for the 90 day challenge bloggers!